For the last 5 years, my 5 daughters have shared one small bathroom. The biggest thorn in my flesh for that room has been all of the toiletries and hair products. Do you have any idea how many toiletries and hair products 5 girls can have. Trust me, it’s more than you can imagine! Well, I had enough! I have been contemplating a solution for a while and finally arrived at one. I went to Wal-Mart and bought some small drawers that are 8″ across and 6″ high. 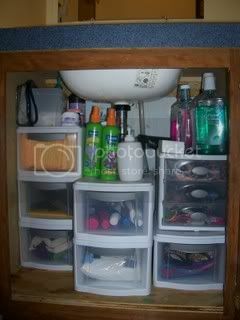 I put 6 of them in the cabinet and organized everything that goes under the sink, into the drawers. It worked as well as I had hoped, if not better. I don’t have a before picture, as it would be too terrifying to see, but here is the after picture. Be sure to visit Rocks in My Dryer to get lots of other great ideas.